Sometimes what looks like “vertebra plana” — a vertebral body compression fracture that is so completely squashed that the body appears as a single line or, depending on extent of purist conviction two closely spaced endplate lines — sometimes that’s not vertebra plana at all. Spine surgeons know this pretty well, or should at least, however most radiologists do need reminding. The mainstay of our imaging is cross-sectional, which captures either a moment in time (CT) or an averaged representation of a time segment (MR). Rarely do we use fluoroscopy or real-time imaging to evaluate fractures the same way we might look at, for example, a TMJ protocol MRI, where jaw movement is captured is what seems like real time (its really quite slow, but good enough). However, just like stand-up MRI (really sit-down MRI, to be exact) offers insight into body mechanics in the more relevant state of weight-bearing, so does fluoroscopy sometimes show a picture quite different from what CT or MR would have suggested. 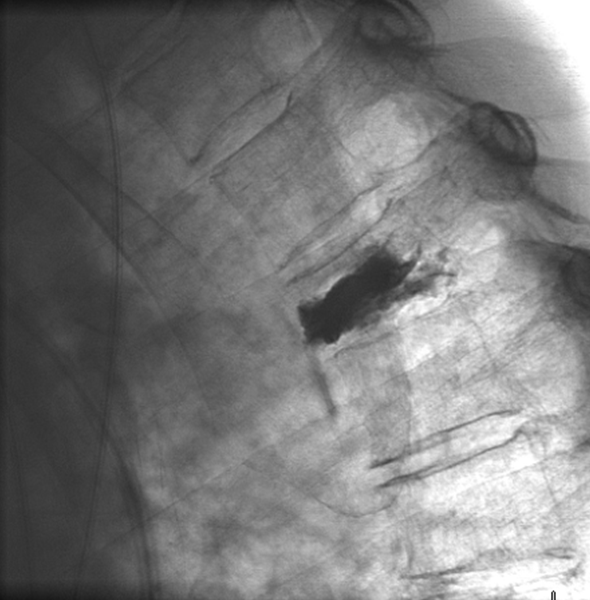 This patient, with osteoporosis and metastatic disease, presented with severe upper thoracic pain that was markedly exacerbated by respiration, particularly inspiration. 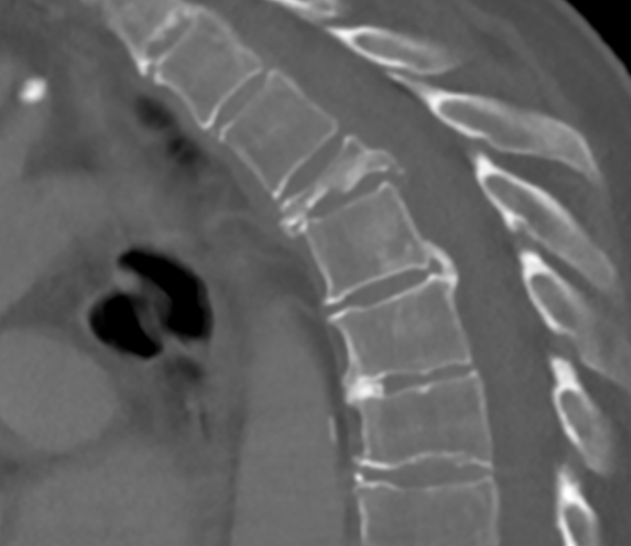 The guarding, in fact, got so bad she developed lower lobe pneumonia, which lead to the discovery of an upper lobe mass… CT scan shows severe T4 vertebral body fracture. 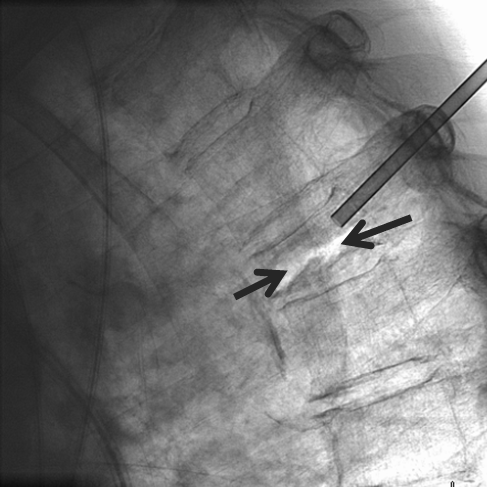 Kyphoplasty balloons are inflated in the fracture line; the balloons are being deformed by breathing motion and bone collapse. Cement filling is done by leaving one of the balloons inflated, and injecting rather thick MMA cement. The inflated balloon props up the body in attempt to restore height. The balloon is then deflated and both sides filled simultaneously. The result is an elevation of height from 6 mm to 12 mm — just about as much as I have ever seen kyphoplasty do. Here is a movie at the end. The endplates are now cemented to each other and do not move. The patient is completely pain-free. 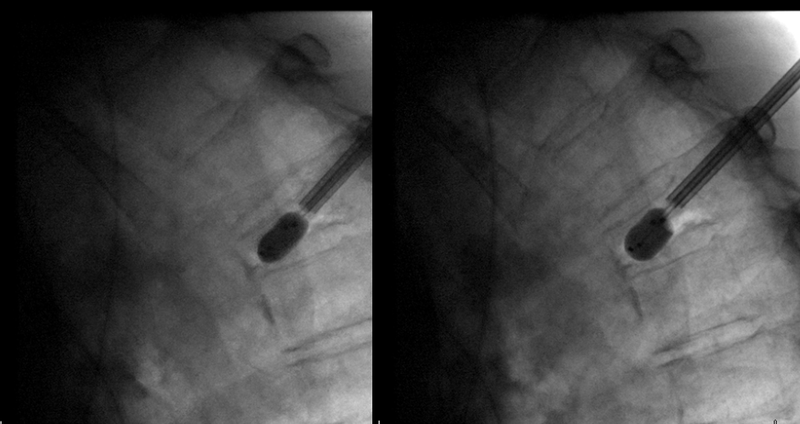 Of note, in many countries outside of US a cage-like device is approved — a balloon-mounted cage (stent like device) is placed into the vertebral body and cage expanded by balloon inflation until one is happy with the morphology. The cement is injected into the balloon, where it tends to stay at least initially, allowing one to remodel otherwise untouchable bones, particularly when there is unilateral collapse. This very useful product is not currently available in US. 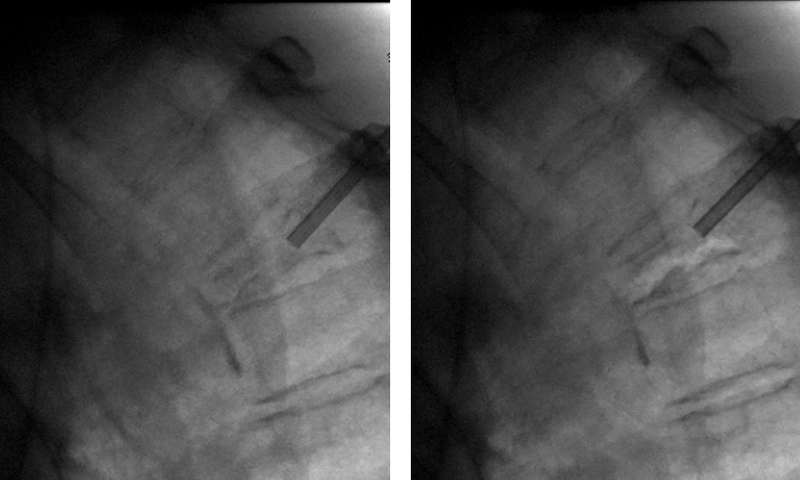 Conclusion: Complete characterization of compression fractures, particularly severe ones, may necessitate the use of fluoroscopy or another real-time technique. Evaluations such as these can help identify patients who may benefit from cement augmentation even when initial cross-sectional imaging suggests otherwise.